Mohs micrographic surgery, an advanced treatment procedure for skin cancer, offers the highest potential for recovery - even if the skin cancer has been previously treated. This procedure is state-of-the-art treatment in which the physician serves as surgeon, pathologist, and reconstructive surgeon. It relies on the accuracy of a microscope to trace and ensure removal of skin cancer down to its roots. This technique allows dermatologists trained in Mohs surgery to see beyond the visible disease and to precisely identify and remove the entire tumor, leaving healthy tissue unharmed. This procedure is most often used in treating two of the most common forms of skin cancer: basal cell carcinoma and squamous cell carcinoma. History: Developed by Frederic E. Mohs, M.D. in the 1930s, the Mohs micrographic surgical procedure has been refined and perfected for more than half a century. Initially, Dr. Mohs removed tumors with a chemosurgical technique. Thin layers of chemically fixed tissue were excised for pathological examination. He developed a unique technique of color-coding excised specimens and created a mapping process to accurately identify the location of remaining cancerous cells. As the process evolved, surgeons refined the technique and now excise the tumor, remove layers of tissue which are color coded, mapped, frozen, sectioned, and immediately examined with the microscope by the physician. The chemosurgical technique developed by Dr. Mohs is no longer used. This reduces the normal treatment time to one visit and allows for immediate reconstruction of the wound. The heart of the procedure - the color-coded mapping of excised specimens and their thorough microscopic examination - remains the definitive and unique part of the Mohs micrographic surgical procedure. Effectiveness: Clinical studies have shown that Mohs micrographic surgery has a five-year cure rate up to 99 percent in the treatment of basal cell and squamous cell carcinomas. Treatment Issues: Common treatment procedures often prove ineffective because they rely on the human eye to determine the extent of the cancer. In an effort to preserve healthy tissue, too little tissue may be removed resulting in recurrence of the cancer. If the surgeon is overcautious, more healthy tissue than necessary may be removed causing excessive scarring. Some tumors do not respond well to common treatments, including those greater than two centimeters in diameter, those in difficult locations, and tumors complicated by previous treatment. Removing a recurring skin cancer is more complicated because scar tissue makes it difficult to differentiate between cancerous and healthy tissue. If microscopic analysis still shows evidence of disease, the process continues, layer-by-layer until the cancer is completely gone. Selective removal of only diseased tissue using Mohs Surgery allows preservation of much of the surrounding normal tissue. This systematic microscopic search reveals the roots of the skin cancer which is why Mohs surgery offers the highest chance for complete removal of the cancer while sparing the normal tissue. Cure rates exceed 99 percent for new cancers, and 95 percent for recurrent cancers. Reconstruction: The best method of managing the wound resulting from surgery is determined after the cancer is completely removed. When the final defect is known, reconstruction is individualized to achieve the best results and to preserve function and maximize aesthetics. The Mohs surgeon is also trained in reconstructive procedures and often will perform the reconstructive procedure necessary to repair the wound. A small wound may be allowed to heal on its own, or the wound may be closed with stitches, a skin graft, or a flap. On occasion, another surgical specialist with unique skills may complete the reconstruction. Cost Effectiveness: Besides it high cure rate, Mohs micrographic surgery also has shown to be cost effective. In a study of costs of various types of skin cancer removal, the Mohs process was found to be comparable when compared to the cost of other procedures, such as electrodesiccation and curettage, cryosurgery, excision, or radiation therapy. Mohs micrographic surgery preserves the maximum amount of normal skin which results in smaller scars. Repairs are more often simple and involve fewer complicated reconstructive procedures. With its high cure rate, Mohs surgery minimizes the risk of recurrence and eliminates the additional costs of larger, more serious surgery for recurrent cancers. The Mohs procedure is performed in the surgeon’s office and pathological examinations are immediate. The entire process is usually completed in a single day. What are the advantages of Mohs surgery and what are my chances for cure? By using detailed mapping techniques and complete microscopic control, Dr. Sundby Johnson can pinpoint areas involved with cancer that are otherwise invisible to the naked eye. Therefore, even the smallest microscopic roots of cancer can be removed. The results are: (1) the removal of as little normal skin as possible, and (2) the highest possibility for curing the cancer. Using Mohs surgery, the percentage of cure is more than 99% for most skin cancers, even when other forms of treatment have failed. Other methods of treatment offer only a 50% chance of a success if previous treatments have failed. Other common treatments for skin cancer (including destroying tissue by scraping, burning, or liquid nitrogen; routine surgery; radiation; and chemical cream) offer lower cure rates and often results in larger wounds. Complications after Mohs surgery are rare, but may include a chance of bleeding or infection. For any complication or questions following the surgery, please review the written instruction sheet we will provide to you on the day of surgery. No, Mohs surgery is performed in a pleasant, out-patient surgical suite and you may return home the same day. Hospital facilities are available if necessary. Yes. Any form of treatment will leave a scar. However, because Mohs surgery removes as little normal tissue as possible, scarring is minimized. Immediately after the cancer is removed, we may choose: (1) to leave the wound to heal itself, (2) to repair the wound with stitches, or (3) to reconstruct the wound with a skin graft or flap. This decision is based on the safest method that will provide the best cosmetic result. Will I have pain or difficulties after the surgery? Most patients do not complain of pain. If there is any discomfort, Tylenol is all that is usually necessary for relief. You will need to refrain from exercise and strenuous activity for a minimum of 2 weeks or more depending on your site of surgery. For best cosmetic results, we ask that you refrain from smoking for 2 to 3 months. 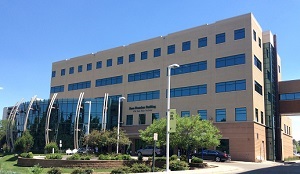 Dr. Sundby’s practice is located in the Rose Medical Center, Rose Founders Building at 4700 Hale Parkway, Suite 140 in Denver.